Home » Blog » How Do ABS Brakes Work? In the past, before the development of 4 wheel ABS, driving cars on loose surfaces was slightly dangerous. The reason behind this is the brakes would lock up if a lot of pressure was applied. When the brakes locked on the wheels, the result is skidding. Skidding results in loss of steering control. The dangers that loss of control of your vehicle pose is unfathomable. In the past, the brakes would lock up if a lot of pressure was applied. Most of the time, excessive pressure is applied to the brakes in emergency situations. Such a situation could be a potential accident. Losing control of your car at such a point could actually cause the accident to occur. The skilled drivers in those days had methods to check this fatal flaw. One such method was cadence braking. This was regulating the pressure on the break to enable you to steer in rapid braking circumstances. Owing to the complexity of these methods of braking, few people actually managed such tactics. Driving cars fast in the snow or gravel before the development of ABS was a dangerous feat. 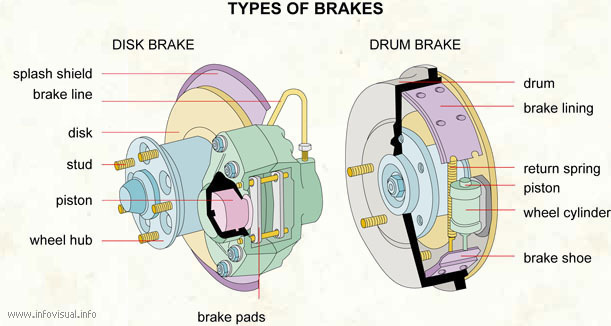 ABS Brakes play a very important role in modern vehicles. 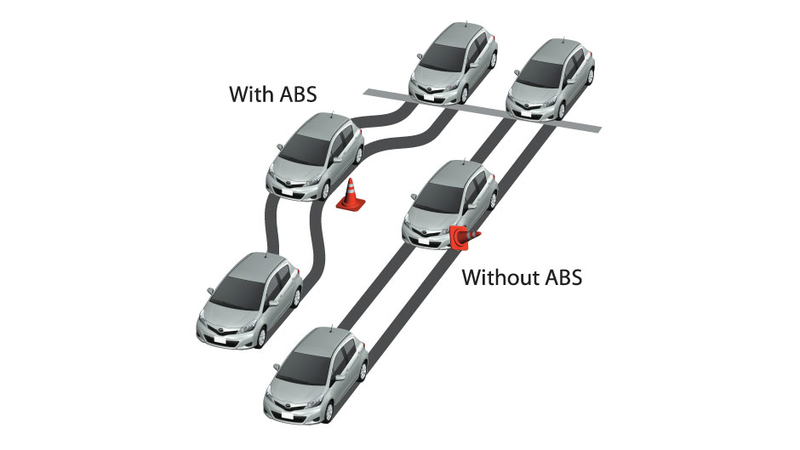 ABS is short for Anti-lock Braking System. This is a brake system that prevents the wheels of the vehicle from ceasing rotation during braking. By not locking up, skidding is eliminated and the vehicle retains traction. The braking system applies the principles of both cadence braking and threshold braking. Threshold braking is a method of braking where the drivers regulate the pressure on the pedal to maximize the braking force. ABS automates the principles of these systems. The effect is a maximization of the amount of braking force developed by the tires. ABS can apply these techniques at a much faster rate and with way more skill than ordinary drivers can manage. The braking system serves two main purposes. One is to decrease the amount of stopping distance. This is especially on surfaces that are slippery or dry. On surfaces that are covered with snow, however, the ABS cannot decrease the braking distance. In this instance, the second purpose of ABS is more important; to increase control of the car under braking. Since the development of the ABS, several improvements have been made by car manufacturers. The milestone development in passenger vehicles was 4 wheel ABS. This started with the “Sure Break” developed by Chrysler in 1971. The system was secure as well as reliable and soon after became the standard in most cars. Therefore, 4 wheel ABS functions to make sure the car is steerable in emergency braking. 4 wheel ABS differs from 2 wheel ABS because 2 wheel ABS only prevents the rear wheels from locking up. Additionally, 2 wheel ABS is put on light trucks and SUVs mainly to prevent them from skidding sideways in emergency braking. This feature enables the vehicles to retain a steady direction. Internally, an ABS system is controlled by a central ECU, hydraulic valves in the individual brakes and four sensors to indicate the wheel speed. The central electronic control unit monitors the speed of each wheel via the sensors. When monitoring, the ECU detects which wheel is rotating slower than the car under braking. This is usually an indication of brakes locking up on the particular wheel. The ECU then sends a message to the valve to reduce braking pressure on the affected wheel. Thus, the wheel does not suffer from increased brake pressure when it rotates slower than the others. In contrast to this, when a wheel is rotating faster than the others, the ECU increases the braking force to the wheel. This effectively slows the vehicle. Some of the ABS systems can eliminate or apply this brake pressure up to 15 times in one second. Effectively, this makes locking up impossible regardless of the conditions. There is a certain threshold speed difference in wheel rotation that the ECU in the ABS is set to disregard. The reason behind this is, during turning, the wheels on the inner side turn slower than those on the outer side. In case of a fault with the ABS, a warning light comes on the dashboard. After this, ABS is automatically disabled until the error is rectified. There are standard ABS systems that function perfectly. In more recent times, electronic stability control systems have gained more popularity. They are an evolution of ABS. the electronic stability control system adopts two more sensors. These are the gyroscopic sensors and the steering wheel sensors. When the gyroscopic sensor detects the car is not going in the direction indicated by the steering wheel sensor, it brakes the individual wheel turning the car in the intended direction. ABS brakes consist of the brake control module, the hydraulic control modulator, and the brake master cylinder. The first component is the sensors of the wheel speeds. Primarily, this component is used to read the speed of the wheel. The sensors can, typically, have inaccurate readings at lower speeds. The valve is the second component. Valves serve three purposes primarily the first being to increase braking pressure. Another purpose is to prevent a rise in braking pressure should more pressure be applied to the brake pedal. The valves also decrease the amount of braking pressure. Sometimes, these valves get clogged. In such a circumstance, the entire ABS fails and a warning light comes on the dashboard. A pump is the third component of the ABS. The pump serves to restore the pressure in the hydraulic braking systems after the valves release the brake fluid. An ECU is the fourth part of the Anti-lock Braking System. It serves as the controller of the entire system. It gets signals each time a wheel loses traction and sends a signal back for the corrective measure. The ECU is the monitor that senses wheels rotating out of the ordinary during deceleration. For a wheel to lock up, it must experience a rapid decrease in speed. The ECU is aware that this situation is not plausible. If it detects the same, it reduces brake pressure on the wheel until it detects an acceleration. After this, it increases the degree of pressure until it detects a deceleration. An ABS system can do this so rapidly that the varying speed of the wheel will have no major influence. The effect is that the car remains steerable even in conditions that are particularly slippery. To indicate this loss of traction to the vehicle’s driver, a pulsating motion will be felt on the pedal. This is indicative of the rapid opening and closing of the valves to vary braking pressure. 4 channel 4 sensor ABS: it has a sensor on each wheel with one central ECU to monitor wheel speeds. Each wheel has its individual sensor. 3 channel 4 sensor ABS: this type has a sensor on each wheel but only the front wheels have individual valves. The two rear wheels share one valve. 3 channel 3 sensor ABS. most common in larger trucks with 4 wheel ABS. each of the front wheels has an individual valve and speed sensor but the rear wheels share one valve and one sensor. 1 channel 1 sensor ABS: found mostly in trucks and SUVs with rear wheel ABS. it has a one-speed sensor and one valve both for the rear wheels. In a report by Monash University on the effectiveness of ABS, the systems reduce multiple crashes by 18%. The systems also increase run-off crashes by at least 35%. On surfaces with high traction, ABS systems reduce the risk of accidents. The systems also reduce the impact that such an accident has on the driver and vehicle. Anti-lock Braking Systems were developed as a safety mechanism. Even highly experienced drivers find it hard to evade crashes without ABS systems. The system increases control of the vehicle in emergency circumstances. The effect is a reduced likelihood of accidents and crashes on the road. It makes cars safer to drive and easier to control in emergencies. Therefore, ABS systems are essential in the world.